Best Commercial security in Houston is an essential element to consider in any proper business planning in the big city. Commercial security customers have different needs, from surveillance and accessibility to security and monitoring. At the same time, safety and efficiency are at the core of any security system consideration. Properly installed surveillance cameras in strategic areas allow your business to flourish by keeping your employees and customers safe. Protecting your assets and allowing you or security personnel to assess internal or external threats to safety and profitability. Security monitoring has so many options for maximizing the efficiency and safety of your commercial property. For security, you can set up your app to receive alerts for any breach of security or any unusual activity. Energy efficiency, you can set and control your thermostats and lights remotely as well as be alerted when certain safety breaches may impact your energy efficiency, like a window being left open allowing the hot air in and causing the A/C to go on. For safety, the carbon monoxide, fire and water sensors may protect you from a serious health and profitability catastrophe. Video Monitoring with easy playback features lets you quickly search for any moment in time that’s been recorded, for checking up on customer or employees disputes or for information needed to provide law personnel for criminal activity. Best Commercial security in Houston Value A proper commercial security system is worth its weight in gold. This is your business you are protecting. You’ll then have peace of mind knowing you took all proper precautions to prevent any loss or unsavory activity. Also that you have implemented systems to keep you informed and to maximize your company’s profitability is priceless. When your commercial business security system is all set up you can relax knowing you have done all you can to allow your business to flourish safely and securely. You have made sure to protect your commercial property and have integrated features for seamless automation and control in your business. Don’t wait another day to protect your office building, your warehouse, your restaurant, your retail shop, your bank, your dealership, your dry cleaners, your construction site, your clinic, farm, casino, hospital, school, church your studio or any business type you may have in Houston. Our trained techs will walk you through your day-to-day business security needs to see how to best suit your security system for your business goals. You can just buy a DIY system and install it yourself. There are some differences though between that DIY system you get and install yourself and the professional companies that come out to install your system and do your monthly monitoring. Here are some things to keep in mind when making the decision between professional vs do-it-yourself security systems. When a professionally trained installer comes out to your home to install your security system, they have lots of experience and know what they’re doing. You can go about your day and let them handle it on their own. If you’re setting up your own DIY system, however, you need to make sure everything was installed properly. Spend time on the phone with customer support, check your system multiple times. This is definitely something you want to make sure you did right. If you go the DIY route, you are in charge of monitoring your system and responding to all emergencies as they come up. If you don’t notice your systems message, as it’s trying to alert you to an intruder you can’t take the action required to get emergency personnel to your property. Professional security system monitoring only be done with a monthly service with a professional security company. They will set up your system to contact the necessary emergency response team to take action even if you are unreachable. One of the many important aspects of a sufficiently installed security system is knowing where to place cameras, sensors and other components of your system. An experienced security specialist will know to look out for any hidden spots on your property and where to optimally place your system accordingly. Best Commercial security in Houston. Running wires all over your property to ensure an optimal security system can take lots of work and needs expertise. If you don’t think you can handle that, it’s best to leave it up to the professionals. You can have your inside security cameras, doorbell, thermostat, and window sensors all set automatically on their own systems. But with an ideal home or office security system, you can automate the whole house in one place. What freedom to have your cameras, sensors, thermostats, doorbells, smoke alarms and water sensors all connected and controlled via your remote app. Ability to not just have access to view and hear what is happening on your property but also to control access remotely is exclusive to professionally installed security systems. You can make changes to your property even from afar. This is the ability to actually remotely control your home with your system. One of the main elements a company may worry about is access control, whether for employees or customers. It is important to consider each area of your business and determine how much accessibility should be allowed. For the Best Commercial security in Houston, Some areas may require highly controlled and limited access. While others stay open to the public and only need special access control after business hours. You may want to keep in mind whether you’ll track each person in your business, or maybe special personnel who have access to restricted areas. In today’s market, there are many options to choose from for security access control, from key cards to access codes to scanners. We make it easy for you to allow and restrict access as needed for your business and to track typical usage patterns as well as any unusual activity that might require your attention. Surveillance is another important aspect of Houston’s commercial security systems. Whether large office building, warehouse or stand-alone office, the surveillance requirements differ but need for surveillance is always there. When you have clear visible CCTV/Video surveillance cameras in and around your business it portrays a business owner who takes his business security very seriously and may thwart unwanted criminal activities. Do you take advantage of all the amazing features your home or business security system can come with? From a simple entry keypad and also a motion sensor, surveillance cameras and security systems have come a long way. Yes, your security system will let you into your home or business with the right keypad pin, but is that all you want from your system? 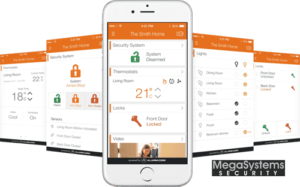 The latest innovative technology in the home and business security offers many helpful, useful and safety features you should consider. Most areas of your home or business aren’t lit at all times. Night vision can be your eyes in the dark. With night vision security cameras you have help in protecting your assets, from theft to intruders. You’ll have evidence of any unauthorized activity at your business site even after-hours when you’re not around. What a wonderful feature license plate recognition can be. This CCTV camera requires specialized software with intelligent traffic modes built-in to capture an identifiable license plate on a still or moving vehicle. Use it to identify intruders or an unauthorized vehicle, and use it to allow access to authorized personnel to your parking structure at your business or home. High-resolution cameras will give you the ability to see more details. A blurry picture of a person won’t give you the ability to identify who the person is. Hence we recommend high-resolution cameras, you’ll see clear facial image to make out who is and identify an intruder and take measurable action and also see that your child’s friend is at the door and allow them in. With the convenience of storing your surveillance recordings on the cloud, you not only can access it from anywhere but your data will also be more secure. Whether you like to keep your data for short term, 1 week for your home or long term, 6 months or more for your business, you can access your information whenever you need it and from wherever you are. With storage on the cloud, you don’t have to be afraid of the system getting broken or vandalized because you’re not using the cameras memory stick, instead the data storage and playback are stored on your online account. Probably one of the best innovations in business and home security is remote accessibility. Everything is done, all features your system includes are accessible easily anywhere you are. You can access your video storage, check if windows or doors have been left open, watch your kids or employees as they work. Adjust your temperature, and get alerts for water leaks, and adjust your lights as needed etc. On any computer, phone or tablet. It’s both remotely accessible and remotely controlled. All your features come with the possibility to be controlled via the remote access app. You can unlock, lock or close your door as needed. You’ll get alerts for things you set up, like extreme temperatures, water leaks, lights staying on or doors left open. You can adjust your lights, temperatures and other security allowance feature from your app no matter your location. It can also help you appear as if you’re home even when you aren’t to dissuade unwanted intruders. Call us if you’re interested in adding any of the features in this article to your current system. If you’re looking for a new security system in Houston or the surrounding areas. (Tanglewood, Galleria, Heights, Saddlewood, Memorial Villages, Memorial Park and many more!). Visit our security systems promotion page to turn your alarm system into a smart security system this summer for fraction of the cost!